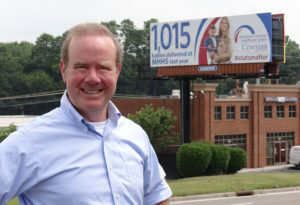 with over 180 displays located on interstate highways and four lane primaries throughout East Tennessee. Elevation Outdoor has sign locations in 12 East Tennessee counties with displays viewed by hundreds of thousands every day. Let us tell the world about your business. At Elevation Outdoor, we are committed to prompt, courteous, and efficient customer service. Our priority is your satisfaction and success. You call us and you speak with us. If we don’t have the board for you, we’ll find it for you. Call Martin Daniel, owner and manager of Elevation Outdoor, with over 16 years of experience in the industry, to discuss how we can assist with your outdoor advertising needs.